You may have heard of the key health benefits of raw cacao, a superfood, but what you may not know is that even raw cacao goes through high levels of processing when its mass farmed and produced. The process of separating the skin from the bean can cause so much heat when done by machines that the cacao is no longer 'raw' as its been heated beyond the magic 42 degrees. Ceremonial Grade Cacao is NOT available in the shops. You won't find it on the high street. It is available for those who are on a path with mama cacao, the spirit of the cacao plant, for it is said that when the world is out of balance, the cacao deva comes out of the forest to restore balance, and once it is restored, she disappears again. RozyGlow began as a concept when Rosanna was invited to experience her first cacao ceremony. This is why it is available on the RozyGlow website as a tool to facilitate deeper multi dimensional states of transformation. You can use the cacao to enhance your experience of any of the digital and coaching programs that RozyGlow offers. I want to try this cacao but have no idea what to do with it! Video links and documents on how to prepare & work with this cacao, including recipes, key benefits, contra-indications is supplied with each sale. Rosanna wanted to share with you how to journey with the cacao deva so prepared a series of videos to answer your questions and give you some ideas as to how you can connect and reap the benefits of working with this gentle and profound teacher. If you would like to experiment with hosting your own cacao ceremonies with friends and family, everything you need to know in order to get going is included with the purchase of this cacao. 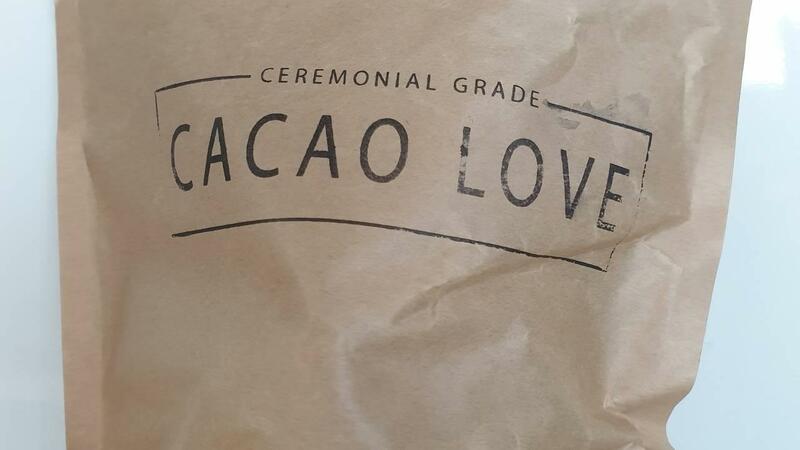 What makes this ceremonial grade cacao so special? Reduces and can eliminate sugar cravings altogether when consumed daily, or instead of refined chocolate. Excellent in the morning instead of coffee, for a sustained creative 'lift' that lasts hours rather than minutes and encourages focus. The perfect afternoon pick me up for frazzled parents of babies through to teens, that supports heart centred communication and enjoyment of the now. Increases oxygen levels in the blood by around 20% so excellent for circulation and low blood pressure. An amazing group facilitator for anything from yoga, meditation, massage, team meetings, and breath work to name a few ideas! Who should not consume Ceremonial Grade Cacao? Animals: Ceremonial grade cacao is deadly to dogs, horses, parrots and will make cats very sick too. Cancer treatment/detox protocols: It will make those who are going through chemotherapy very nauseous if taken in ceremonial quantities, same for those on a raw food diet who consume high doses of raw cacao regularly. Anti depressants: The MAO inhibitors and Tryptophan in this cacao do not mix well with some anti depressants. Google your medication and please contact me so that we can adjust the suggested cacao dose to suit your needs. Heart conditions/blood pressure issues: Raw cacao increases heart rate significantly and is a vasodilator , opening blood vessels and increasing blood flow, which reduces blood pressure, if its high. Caution is recommended with very low blood pressure and a lower dose suggested, though in most cases, the cacao will increase the blood pressure when it is low. Pregnant/breastfeeding: Lower doses are recommended in pregnancy or when breastfeeding. It is suggested that up to 28grms a day is fine, though best to start with lower amount and increase as needed. Sensitive types/low body weight/migraines from caffeine: Take less and increase your dose carefully to find your balance. This Guatemalan cacao is lowest in caffeine and higher in theobromine which is the main stimulant in this cacao and is caffeine related. Aerobic over exertion/use of sauna etc: Lower doses of cacao work very well with hiking, dance movement medicine, and yoga workshops for example. Drinking high does of cacao followed by intense aerobic activity and then a sauna for example, would likely induce nausea and n some instances vomiting. How can I use this cacao with my RozyGlow digital products and/or coaching program? You can prepare a dose of up to 28 grams before sitting down to watch one of the videos, or listen to an audio, or fill out the workbook. For those of you engaged with Rosanna's RozyGlow online coaching program, preparing some cacao to have before or during the early part of the live call will help you to journey deeper and bypass the usual blocks in your own consciousness. You can play around with your dose and if you wanted to experience the effects of a ceremonial dose when on a live call, this would work well, but caution to those of you sensitive to caffeine as you may be up very late that night!